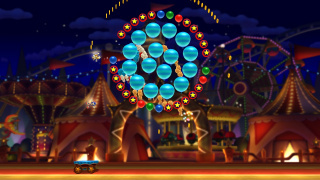 The Circus in Sonic Lost World, appearing exclusively in the Wii U version of the game, acts as the Bonus Stage in the game. Circuses appear on the world map as yellow and red circus tents that are unlocked as the player collects Red Star Rings throughout the game, and once a Circus has been played, it disappears from the map. In a Circus, the player must play a time-limited mini-game where they launch Sonic and Tails into balloons to collect Rings and Animals to assist in unlocking new levels. To launch the characters into the air, the player controls either a trampoline, a cannon, or a seesaw (depending on which Zone the circus is in) by sliding the stylus across the Wii U GamePad's screen. With the trampoline, the player must bounce a character into the air. With the cannon, they must tap the cannon to shoot a character into the air. With the seesaw, they must make a character land on one end of the seesaw to launch the other. If the player misses a character, that character disappears, and if both characters are gone, the player loses a life and the characters reset to their start positions. When time runs out or the player loses all three lives, the Circus ends. Later on in the game, after Tails is kidnapped during the story, Orbot or Cubot will take Tails' place in the Circus. A Circus on the Windy Hill map.